The kids in the shot were playing soccer in front of the church and the ball hit some people walking by. 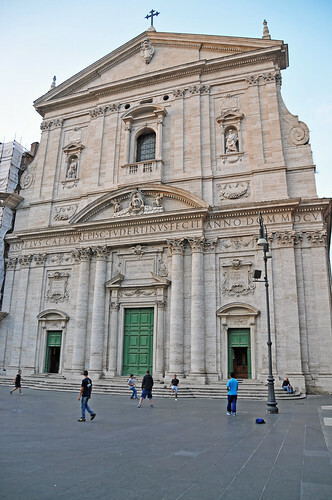 Santa Maria in Vallicella, also called Chiesa Nuova, which today faces onto the main thoroughfare of the Corso Vittorio Emanuele. It is the principal church of the Oratorians, a religious congregation of secular priests, founded by St Philip Neri in 1561 at a time in the 16th century when the Counter Reformation saw the emergence of a number of new religious organisations such as the Society of Jesus (Jesuits), the Theatines and the Barnabites. Pope Gregory I built the first church on the site. By the 12th century, it was dedicated to Santa Maria in Vallicella ("Our Lady in the Little Valley").